Here's some Archer Airguns Gold Service test targets for the new Stoeger ATAC air rifle. In review, we can see that in .177 caliber, the Stoeger ATACs tested are shooting around 880fps with 8.64 grain Stoeger X-Field pellets. That's just under 15 ft/lbs of muzzle energy. 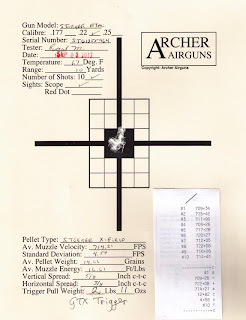 Standard Deviation is very well controlled for a new gun at less than 8 fps for the 10 shots. The .22 caliber guns tested give a muzzle velocity in the 715 - 750fps range with Stoeger X-Field (14.66 grain) pellets. Muzzle energy is in the 16.5 - 18 ft/lbs range. Again Standard Deviation is good at between 4.5 and 12 fps for 10 shots. Note that the trigger pull weight varies around 5 - 6lbs with the factory trigger This is normal for all Stoeger Airguns. The GTX Generation-II trigger (which is specified by most of our customers for these guns) gives a much better pull weight of 3 lbs or less, as you can see in three of the test targets, together with improved feel and shorter length of pull. 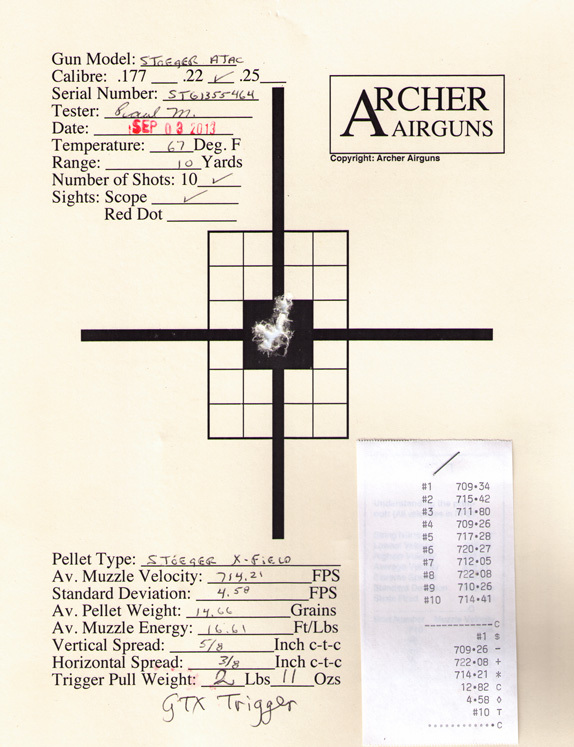 The GTX is a great improvement for practical shooting of these air rifles! In summary, performance of the new ATAC is very much as anticipated. 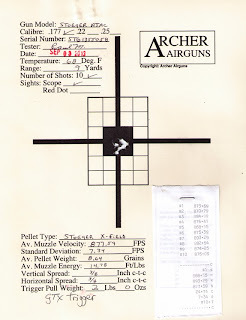 The guns are quiet: very similar to the noise level of the Stoeger X20 Suppressor. 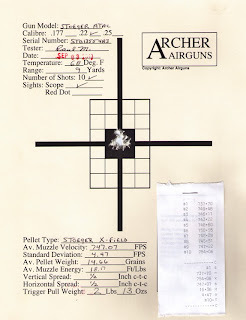 Paul, who shot these targets, feels that accuracy is excellent - at or above our normal tested results for Stoeger Airguns. 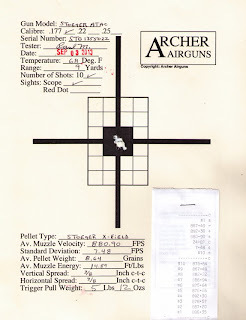 He and I both find the ATAC comfortable to shoot and like the 4 - 16 x 40AO scope. This is an excellent new air rifle.